Hey there! I’ve put my senior thesis comic, Bacchanalia, up for sale – it’s a story about college, friendship, and Greek myths. Different from SFP, in that I wrote the script and drew it, but I thought you guys might be interested. You can buy a copy here! Pintsize is such a delightfully tragic character and I love him so much. I’ve had this conversation with myself so many times and it’s wonderful seeing it explored. Yes, absolutely. Looking forward to seeing how this conversation goes: I think he’s got a point worth exploring. 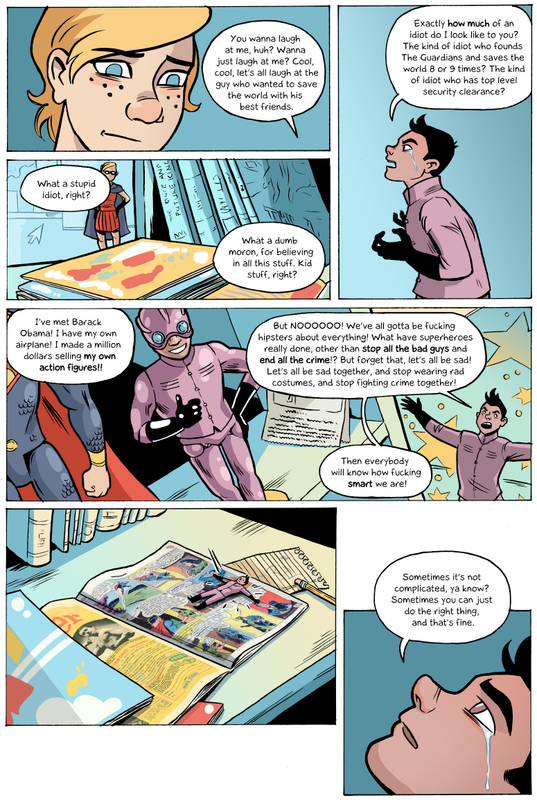 Sounds like Pintsize wants to reconstruct the idea of superheroes to the way it was.